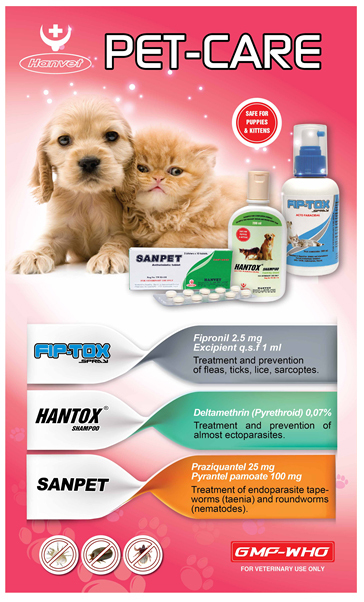 HANVET Pet Clinic is a branch of HANVET Company, serving the diversified need of caring for pet’s health and beauty. Founded in 2001 as one of the very first centers in Hanoi, HANVET Pet clinic has gradually become an accredited address for pet-lovers. Equipped with a variety of cutting-edge technology and equipment such as X-ray and Ultrasound, we, as a good team of rich-experienced and enthusiastic veterinarians, could help diagnosis your pet’s diseases at the early stage for prompt and effective treatment. 1. Medical services: medical examination and treatment for pet, vaccination, regular deworming, antenatal care, pregnancy ultrasound, dystocia intervention, X-ray, blood test, etc. 2. Surgical services: cesarean surgery, sterilization, handling fractures, etc. 4. Beauty services for dogs and cats: tail cutting, manicure, hair trimming, etc. 5. Others: provision of toys, feedstuff, vitamins and many other pet-care products. Particularly, our best sellers at HANVET Pet Clinic are exactly our products made with love and care for safety of puppies and kittens. Clinic 1: 88 Truong Chinh road, Dong Da district, Hanoi. 2 Add: 200 Cho Hang Cu road, Du Hang Kenh ward, Le Chan district, Hai phong. Clinic 2: 490 Hoang Hoa Tham road, Ba Đinh district, Hanoi. Clinic 3: 126 Trung Kinh road, Cau Giay district, Hanoi.